John Tyler was born on March 29, 1790 in Charles City County, Virginia, a member of the tobacco planting aristocracy of Tidewater Virginia. His father, John Tyler, was an American Revolution patriot who served three terms as Governor of Virginia from 1808 to 1811. His mother was Mary Armistead. Tyler was brought up believing that the Constitution was to be strictly interpreted and he never strayed from that belief. Aspiring to a career in politics, he attended the College of William and Mary studying law. He graduated in 1807 and was admitted to the bar in 1809. Devoted to the principles of Thomas Jefferson of state rights and a strictly limited power for the federal government he entered politics. Tyler was known as an independent, refusing to compromise on principles to please political allies. At the age of 21, he was elected to the Virginia legislature. This was the beginning of a career in state and national politics lasting until he left the presidency in 1845. Tyler first married Letitia Christian on March 29, 1813. They had eight children. Two years after the death of his first wife, Tyler married Julia Gardiner on June 26, 1844, thus becoming the first president to marry while in office. They had seven children. 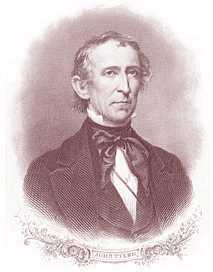 John Tyler was the first Vice President to succeed to the presidency upon the death of the incumbent. Tyler served only one single term, the term remaining of predecessor William Henry Harrison. His detractors dubbed him "His Accidency". He was engaged in bitter struggles with his rivals in congress. Throughout his career Tyler displayed a political independence and a commitment to state rights. He became a member of the House of Representatives and served from 1816 to 1821. While in the House, Tyler voted against most nationalist legislation and opposed the Missouri Compromise. Tyler consistently opposed the Bank of the United States with state branches throughout the tenure of his career. This he saw as a federal infringement of the constitutional rights of the states. Tyler served five years in the state legislature. His first political act was to censure United States Senators from Virginia for supporting, and in one case, voting to re-charter the bank. However, in 1836 Tyler sided with bank advocates against President Jackson when the Senate moved to remove from record the censure of Jackson for his removal of federal funds from the bank. Tyler resigned his seat rather than vote as directed and severed his Democratic Party ties. Upon leaving the House he served in the United States Senate from 1827 to 1836. As Senator, he supported Andrew Jackson for President reluctantly. Later, Tyler would join with Henry Clay, Daniel Webster and their newly formed Whig party in opposing President Jackson. John Tyler, like his father, served twice as Governor of Virginia. Hoping to broaden their electoral appeal, The Whig Party nominated Tyler for Vice President as William Henry Harrison in 1840. Tyler's admiration of Henry Clay, the Whig leader in the Senate, added to his appeal. The slogan "Tippecanoe and Tyler Too" became the 'battle cry' of convention members. Within one short month after his inauguration, the victorious Harrison had died of pneumonia. John Tyler succeeded him to the Presidency and took the oath of office as prescribed for the President in the Constitution on April 6, 1841. Due to the fact that he was the first person to assume the Presidency without having been elected to the office, many contended that he was only an acting president. Tyler, however, insisted that he was president in the full sense of the word. Nationalist Whigs intended to force him to accept their legislative program. Henry Clay had assumed that the new president would pass legislation favored by the Whigs. The Whig leadership and Clay were infuriated when Tyler vetoed two successive Whig-sponsored bills that would have allowed a national bank to open branches in the states without state consent. Relations became so strained that Tyler was placed in the position of vetoing more bills than Jackson had. Congress for the first time in history overrode a presidential veto. The most significant domestic measure of Tyler's single term was the Preemption Act of 1841 giving squatters on government lands the right to buy 160 acres at the minimum auction price, without competitive bidding. Tyler's greatest successes came in the realm of foreign policy. He had supported Webster in the talks that lead to the 1842 Webster-Ashburton Treaty, settling the Maine boundary dispute. He ended the Seminole War, extended the Monroe Doctrine to Hawaii, and opened the first American trade mission to China. In 1842, the House adopted a resolution charging him with offenses justifying impeachment for vetoing a protective tariff, the first impeachment resolution in history against a President. A committee headed by Representative John Quincy Adams reported that the President had misused the veto power, but without the necessary votes, the resolution failed. When members of his cabinet quit their positions, Tyler simply replaced them with men of his own choosing. Daniel Webster, who was Secretary of State, was a holdover. Tyler pondered between creating a new party or aligning with the Democrats as their candidate in 1844. He also considered running as an independent, putting the election into the House, but gave up the idea when the Democrats nominated James K. Polk and came out for the annexation of Texas. His last act as president was to sign the bill providing for the annexation of Texas. Now a man without a party, he did not run for reelection in 1844. Democrat James K. Polk won the presidency over Henry Clay. Tyler retired to his Virginia plantation in 1845. He returned to public life in February 1861 and served as chairman of the peace convention called to avert civil war. As a member of the Virginia convention elected to consider Virginia's secession on the eve of the American Civil War, Tyler voted for withdrawal from the Union. He served briefly in the Confederate Congress and was elected to its House of Representatives, but died before he could take office. He died in Richmond, Virginia on January 18, 1862. TYLER, John, tenth president of the United States, born at Greenway, Charles City County, Virginia, 29 March, 1790; died in Richmond, Virginia, 18 January, 1862. He was the second son of Judge John Tyler and Mary Armistead. In early boyhood he attended the small school kept by a Mr. McMurdo, who was so diligent in his use of the birch that in later years Mr. Tyler said " it was a Wonder he did not whip all the sense out of his scholars." At the age of eleven young Tyler was one of the ringleaders in a rebellion in which the despotic McMurdo was overpowered by numbers, tied hand and foot, and left locked up in the school-house until late at night, when a passing traveler effected an entrance and released him. On complaining to Judge Tyler, the indignant school-master was met with the apt reply, "Sic semper tyrannis!" The future president was graduated at William and Mary in 1807. At college he showed a strong interest in ancient history. He was also fond of poetry and music, and, like Thomas Jefferson, was a skilful performer on the violin. In 1809 he was admitted to the bar, and had already begun to obtain a good practice when he was elected to the legislature, and took his seat in that body in December, 1811. He was here a firm supporter of Mr. Madison's administration, and the war with Great Britain, which soon followed, afforded him an opportunity to become conspicuous as a forcible and persuasive orator. One of his earliest public acts is especially interesting in view of the famous struggle with the Whigs, which in later years he conducted as president. The charter of the first Bank of the United States, established in 1791, was to expire in twenty years; and in 1811 the question of renewing the charter came before congress. The bank was very unpopular in Virginia, and the assembly of that state, by a vote of 125 to 35, instructed its senators at Washington, Richard Brent and William B. Giles, to vote against a re-charter. The instructions denounced the bank as an institution in the founding of which congress had exceeded its powers and grossly violated state rights. Yet there were many in congress who, without approving the principle upon which the bank was founded, thought the eve of war an inopportune season for making a radical change in the financial system of the nation. Of the two Virginia senators, Brent voted in favor of the re-charter, and Giles spoke on the same side, and although, in obedience to instructions, he voted contrary to his own opinion, he did so under protest. On 14 January, 1812, Mr. Tyler, in the Virginia legislature, introduced resolutions of censure, in which the senators were taken to task, while the Virginia doctrines, as to the unconstitutional character of the bank and the binding force of instructions, were formally asserted. Mr. Tyler married, 29 March, 1813, Letitia, daughter of Robert Christian, and a few weeks afterward, was called into the field at the head of a company of militia to take part in the defense of Richmond and its neighborhood, now threatened by the British. This military service lasted for a month, during which Mr. Tyler's company was not called into action. He was re-elected to the legislature annually, until in November, 1816, he was chosen to fill a vacancy in the United States house of representatives. In the regular election to the next congress, out of 200 votes given in his native county, he received all but one. As a member of congress he soon made himself conspicuous as a strict constructionist. When Mr. Calhoun introduced his bill in favor of internal improvements, Mr. Tyler voted against it. He opposed the bill for changing the per diem allowance of members of congress to an annual salary of $1,500. He opposed, as premature, Mr. Clay's proposal to add to the general appropriation bill a provision for $18,000 for a minister to the provinces of the La Plata, thus committing the United States to a recognition of the independence of those revolted provinces. He also voted against the proposal for a national bankrupt act. He condemned, as arbitrary and insubordinate, the course of General Jackson in Florida, and contributed an able speech to the long debate over the question as to censuring that gallant commander. He was a member of a committee for inquiring into the affairs of the national bank, and his most elaborate speech was in favor of Mr. Trimble's motion to issue a scire facias against that institution. On all these points Mr. Tyler's course seems to have pleased his constituents: in the spring election of 1819 he did not consider it necessary to issue the usual circular address, or in any way to engage in a personal canvass. He simply distributed copies of his speech against the bank, and was re-elected to congress unanimously. 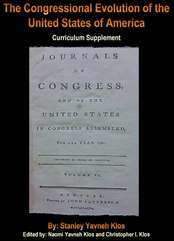 The most important question that came before the 16th congress related to the admission of Missouri to the Union. In the debates over this question Mr. Tyler took ground against the imposition of any restrictions upon the extension of slavery. At the same time he declared himself on principle opposed to the perpetuation of slavery, and he sought to reconcile these positions by the argument that in diffusing the slave population over a wide area the evils of the institution would be diminished and the prospects of ultimate emancipation increased. " Slavery," said he, "has been represented on all hands as a dark cloud, and the candor of the gentleman from Massachusetts [Mr. Whitman] drove him to the admission that it would be well to disperse this cloud. In this sentiment I entirely concur with him. How can you otherwise disarm it? Will you suffer it to increase in its darkness over one particular portion of this land till its horrors shall burst upon it? Will you permit the lightnings of its wrath to break upon the south, when by the interposition of a wise system of legislation you may reduce it to a summer's cloud?" Mr. Tyler was unquestionably foremost among the members of congress in occupying this position. When the Missouri compromise bill was adopted by a vote of 134 to 42, all but five of the nays were from the south, and from Virginia alone there were seventeen, of which Mr. Tyler's vote was one. The Richmond "Enquirer" of 7 March, 1820, in denouncing the compromise, observed, in language of prophetic interest, that the southern and western representatives now "owe it to themselves to keep their eyes firmly fixed on Texas; if we are cooped up on the north, we must have elbow-room to the west." Mr. Tyler's further action in this congress related chiefly to the question of a protective tariff, of which he was an unflinching opponent. In 1821, finding his health seriously impaired, he declined a re-election, and returned to private life. His retirement, however, was of short duration, for in 1823 he was again elected to the Virginia legislature. Here, as a friend to the candidacy of William II. Crawford for the presidency, he disapproved the attacks upon the congressional caucus begun by the legislature of Tennessee in the interests of Andrew Jackson. The next year he was nominated to fill the vacancy in the United States senate created by the death of John Taylor; but Littleton W. Tazewell was elected over him. He opposed the attempt to remove William and Mary college to Richmond, and was afterward made successively rector and chancellor of the college, which prospered signally under his management. In December, 1825, he was chosen by the legislature to the governorship of Virginia, and in the following year he was re-elected by a unanimous vote. A new division of parties was now beginning to show itself in national polities. The administration of John Quincy Adams had pronounced itself in favor of what was then, without much regard to history, described as the "American system" of government banking, high tariffs, and internal improvements. Those persons who were inclined to a loose construction of the constitution were soon drawn to the side of the administration, while the strict constructionists were gradually united in opposition. Many members of Crawford's party, under the lead of John Randolph, became thus united with the Jacksonians, while others, of whom Mr. Tyler was one of the most distinguished, maintained a certain independence in opposition. It is to be set down to Mr. Tyler's credit that he never attached any importance to the malicious story, believed by so many Jacksonians, of a corrupt bargain between Adams and Clay. Soon after the meeting of the Virginia legislature, in December, 1826, the friends of Clay and Adams combined with the members of the opposite party who were dissatisfied with Randolph, and thus Mr. Tyler was elected to the United States senate by a majority of 115 votes to 110. Some indiscreet friends of Jackson now attempted to show that there must have been some secret and reprehensible understanding between Tyler and Clay; but this scheme failed completely. In the senate Mr. Tyler took a conspicuous stand against the so-called " tariff of abominations" enacted in 1828, which Benton, Van Buren, and other prominent Jacksonians, not yet quite clear as to their proper attitude, were induced to support. There was thus some ground for the opinion entertained at this time by Tyler, that the Jacksonians were not really strict constructionists. In February, 1830, after taking part in the Virginia convention for revising the state constitution, Mr. Tyler returned to his seat in the senate, and found himself first drawn toward Jackson by the veto message of the latter, 27 May, upon the Maysville turnpike bill. He attacked the irregularity of Jackson's appointment of commissioners to negotiate a commercial treaty with Turkey without duly informing the senate. On the other hand, he voted in favor of confirming the appointment of Van Buren as minister to Great Britain. In the presidential election of 1832 he supported Jackson as a less objectionable candidate than the others, Clay, Wirt, and Floyd. Mr. Tyler disapproved of nullification, and condemned the course of South Carolina as both unconstitutional and impolitic. At the same time he objected to President Jackson's famous proclamation of 10 December, 1832, as a "tremendous engine of federalism," tending to the "consolidation" of the states into a single political body. Under the influence of these feelings he undertook to play the part of mediator between Clay and Calhoun, and in that capacity earnestly supported the compromise tariff introduced by the former in the senate, 12 February, 1833. On the so-called "force bill," clothing the president with extraordinary powers for the purpose of enforcing the tariff law, Mr. Tyler showed that he had the courage of his convictions. When the bill was put to vote, 20 February, 1833, some of its opponents happened to be absent, others got up and went out in order to avoid putting themselves on record. The vote, as then taken, stood: yeas, thirty-two; nay, one (John Tyler). As President Jackson's first term had witnessed a division in the Democratic party between the nullifiers led by Calhoun and the unconditional upholders of the Union, led by the president himself, with Benton, Blair, and Van Buren, so his second term witnessed a somewhat similar division arising out of the war upon the United States bank. The tendency of this fresh division was to bring Mr. Tyler and his friends nearer to co-operation with Mr. Calhoun, while at the same time it furnished points of contact that might, if occasion should offer, be laid hold of for the purpose of forming a temporary alliance with Mr. Clay and the National Republicans. The origin of the name "Whig," in its strange and anomalous application to the combination in 1834, is to be found in the fact that it pleased the fancy of President Jackson's opponents to represent him as a kind of arbitrary tyrant. On this view it seemed proper that they should be designated "Whigs," and at first there were some attempts to discredit the supporters of the administration by calling them "Tories." On the question of the bank, when it came to the removal of the deposits, Mr. Tyler broke with the administration. Against the bank he had fought, on every fitting occasion, since the beginning of his public career. In 1834 he declared emphatically: "I believe the bank to be the original sin against the constitution, which, in the progress of our history, has called into existence a numerous progeny of usurpations. Shall I permit this serpent, however bright its scales or erect its mien, to exist by and through my vote?" Nevertheless, strongly as he disapproved of the bank, Mr. Tyler disapproved still more strongly of the methods by which President Jackson assailed it. There seemed at that time to be growing up in the United States a spirit of extreme unbridled democracy quite foreign to the spirit in which our constitutional government, with its carefully arranged checks and limitations, was founded. It was a spirit that prompted mere majorities to insist upon having their way, even at the cost of overriding all constitutional checks and limits. This spirit possessed many members of Jackson's party, and it found expression in what Benton grotesquely called the "demos krateo" principle. A good illustration of it was to be seen in Benton's argument, after the election of 1824, that Jackson, having received a plurality of electoral votes, ought to be declared president, and that the house of representatives, in choosing Adams, was "defying the will of the people." In similar wise President Jackson, after his triumphant re-election in 1832, was inclined to interpret his huge majorities as meaning that the people were ready to uphold him in any course that he might see fit to pursue. This feeling no doubt strengthened him in his determined attitude toward the nullifiers, and it certainly contributed to his arbitrary and overbearing method of dealing with the bank, culminating in 1833 in his removal of the deposits. There was ground for maintaining that in this act the president exceeded his powers, and it seemed to illustrate the tendency of unbridled democracy toward despotism, under the leadership of a headstrong and popular chief. Mr. Tyler saw in it such a tendency, and he believed that the only safeguard for constitutional government, whether against the arbitrariness of Jackson or the latitudinarianism of the National Republicans, lay in a most rigid adherence to strict constructionist doctrines. Accordingly, in his speech of 24 February, 1834, he proposed to go directly to the root of the matter and submit the question of a national bank to the people in the shape of a constitutional amendment, either expressly forbidding or expressly allowing congress to create such an institution. According to his own account, he found Clay and Webster ready to co-operate with him in this course, while Calhoun held aloof. Nothing came of the project; but it is easy to see in Mr. Tyler's attitude at this time the basis for a short-lived alliance with the National Republicans, whenever circumstances should suggest it. On Mr. Clay's famous resolution to censure the president he voted in the affirmative. In the course of 1835 the seriousness of the schism in the Democratic party was fully revealed. Not only had the small body of nullifiers broken away, under the lead of Calhoun, but a much larger party was formed in the southern states under the appellation of "state-rights Whigs." They differed with the National Republicans on the fundamental questions of tariff, bank, and internal improvements, and agreed with them only in opposition to Jackson as an alleged violator of the constitution. Even in this opposition they differed from the party of Webster and Clay, for they grounded it largely upon a theory of state rights which the latter statesmen had been far from accepting. The "state-rights Whigs" now nominated Hugh L. White, of Tennessee, for president, and John Tyler for vice-president. The National Republicans wishing to gather votes from the other parties, nominated for president General William H. Harrison as a more colorless candidate than Webster or Clay. The Democratic followers of Jackson nominated Van Buren, who received a large majority of both popular and electoral votes, in spite of the defections above mentioned. There was a great deal of bolting in this election. Massachusetts threw its vote for Webster for president, and South Carolina for Willie P. Mangum. Virginia, which voted for Van Buren, rejected his colleague, Richard M. Johnson, and cast its twenty-three electoral votes Smith, of Alabama, for vice-president. Mr. White obtained the electoral votes of Tennessee and Georgia, twenty-six in all, but Mr. Tyler made a better showing ; he carried, besides these two states, Maryland and South Carolina, making forty-seven votes in all. The unevenness of the results was such that the election of a vice-president devolved upon the senate, which chose Mr. Johnson. In the course of the year preceding the election an incident occurred which emphasized more than ever Mr. Tyler's hostility to the Jackson party. Benton's famous resolutions for expunging the vote of censure upon the president were before the senate, and the Democratic legislature of Virginia instructed the two senators from that state to vote in the affirmative. As to the binding force of such instructions Mr. Tyler had long ago, in the ease of Giles and Brent, above mentioned, placed himself unmistakably upon record. His colleague, Benjamin Watkins Leigh, was known to entertain similar views. On receiving the instructions, both senators refused to obey them. 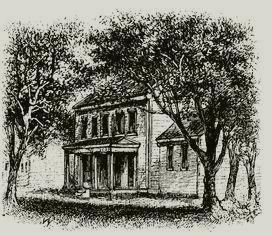 Both voted against the Benton resolutions, but Mr. Leigh kept his seat, while Mr. Tyler resigned and returned home, 29 February, 1836. About this time the followers of Calhoun were bringing forward what was known as the "gag resolution" against all petitions and motions relating in any way to the abolition of slavery. Mr. Tyler's resignation occurred before this measure was adopted, but his opinions on the subject were clearly pronounced. He condemned the measure as impolitic, because it yoked together the question as to the right of petition and the question as to slavery, and thus gave a distinct moral advantage to the Abolitionists. On the seventh anniversary of the Virginia colonization society, 10 January, 1838, he was chosen its president. In the spring election of that year he was returned to the Virginia legislature. In January, 1839, his friends put him forward for re-election to the United States senate, and in the memorable contest that ensued, in which William C. Rives was his principal competitor, the result was a deadlock, and the question was indefinitely postponed before any choice had been made. Meanwhile the financial crisis of 1837--the most severe, in many respects, that has ever been known in this country--had wrecked the administration of President Van Buren. The causes of that crisis, indeed, lay deeper than any acts of any administration. The primary cause was the sudden development of wild speculation in western lands, consequent upon the rapid building of railroads, which would probably have brought about a general prostration of credit, even if President Jackson had never made war upon the United States bank. But there is no doubt that some measures of Jackson's administration--such as the removal of the deposits and their lodgment in the so-called "pet banks," the distribution of the surplus followed by the sudden stoppage of distribution, and the sharpness of the remedy supplied by the specie circular --had much to do with the virulence of the crisis. For the moment it seemed to many people that all the evil resulted from the suppression of the bank, and that the proper cure was the reinstatement of the bank, and because President Van Buren was too wise and clear-sighted to lend his aid to such a policy, his chances for re-election were ruined. The cry for the moment was that the hard-hearted administration was doing nothing to relieve the distress of the people, and there was a general combination against Van Buren. For the single purpose of defeating him, all differences of policy were for the moment subordinated. In the Whig convention at Harrisburg, 4 December, 1839, no platform of principles was adopted. General Harrison was again nominated for the presidency, as a candidate fit to conciliate the anti-Masons and National Republicans whom Clay had offended, and Mr. Tyler was nominated for the vice-presidency in order to catch the votes of such Democrats as were dissatisfied with the administration. In the uproarious canvass that followed there was probably less appeal to sober reason and a more liberal use of clap-trap than in any other presidential contest in our history. Borne upon a great wave of popular excitement, "Tippecanoe, and Tyler too," were carried to the White House. By the death of President Harrison, 4 April, 1841, just a month after the inauguration, Mr. Tyler became president of the United States. The situation thus developed was not long in producing startling results. Although no platform had been adopted in the nominating convention, it soon appeared that Mr. Clay and his friends intended to use their victory in support of the old National Republican policy of a national bank, a high tariff, and internal improvements. Doubtless most people who voted for Harrison did so in the belief that his election meant the victory of Clay's doctrines and the reestablishment of the United States bank. Mr. Clay's own course, immediately after the inauguration, showed so plainly that he regarded the election as his own victory that General Harrison felt called upon to administer a rebuke to him. "You seem to forget, sir," said he, "that it is I who am president." Tyler, on the other hand, regarded the Whig triumph as signifying" the overthrow of what he considered a corrupt and tyrannical faction led by Jackson, Van Buren, and Benton; he professed to regard the old National Republican doctrines as virtually postponed by the alliance between them and his own followers. In truth, it was as ill-yoked an alliance as ever was made. The elements of a fierce quarrel were scarcely concealed, and the removal of President Harrison was all that was needed to kindle the flames of strife. "Tyler dares not resist," said Clay; "I'll drive him before me." On the other hand, the new president, declared: " 1 pray you to believe that my back is to the wall, and that, while I shall deplore the assaults, I shall, if practicable, beat back the assailants"; and he was as good as his word. Congress met in extra session, 31 May, 1841, the senate standing 28 Whigs to 22 Democrats, the house 133 Whigs to 108 Democrats. 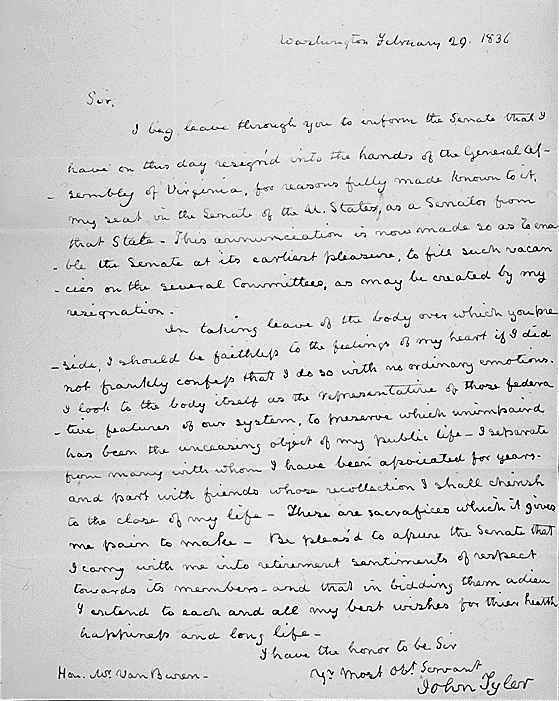 In his opening message President Tyler briefly recounted the recent history of the United States bank, the sub-treasury system, and other financial schemes, and ended with the precautionary words : "I shall be ready to concur with you in the adoption of such system as you may propose, reserving to myself the ultimate power of rejecting any measure which may, in my view of it, conflict with the constitution or otherwise jeopardize prosperity of the country, a power which I could not part with, even if I would, but which I will not believe any act of yours will call into requisition." Congress disregarded the warning. Tile ground was cleared for action by a bill for abolishing Van Buren's sub-treasury system, which passed both houses and was signed by the president. But an amendment offered by Mr. Clay, for the repeal of the law of 1836 regulating the deposits in the state banks, was defeated by the votes of a small party led by William C. Rives. The great question then came up. On constitutional grounds, Mr. Tyler's objection to the United States bank had always been that congress had no power to create such a corporation within the limits of a state without the consent of the state ascertained beforehand. He did not deny, however, the power of congress to establish a district bank for the District of Columbia, and, provided the several states should consent, there seemed to be no reason why this district bank should not set up its branch offices all over the country. Mr. Clay's so-called "fiscal bank" bill of 1841 did not make proper provision for securing the assent of the states, and on that ground Mr. Rives proposed an amendment substituting a clause of a bill suggested by Thomas Ewing, secretary of the treasury, to the effect that such assent should be formally secured. Mr. Rives's amendment was supported not only by several "state-rights Whigs," but also by senators Richard It. Bayard and Rufus Choate, and other friends of Mr. Webster. If adopted, its effect: would have been conciliatory, and it might perhaps have averted for a moment the rupture between the ill-yoked allies. The Democrats, well aware of this, voted against the amendment, and it was lost. The bill incorporating the fiscal bank of the United States was then passed by both houses, and on 16 August was vetoed. An attempt to pass the bill over the veto failed of the requisite two-third majority. The Whig leaders had already shown a disposition to entrap the president. Before the passage of Mr. Clay's bill, John Minor Botts was sent to the White House with a private suggestion for a compromise. Mr. Tyler refused to listen to the suggestion except with the understanding that, should it meet with his disapproval, he should not hear from it again. The suggestion turned out to be a proposal that congress should authorize the establishment of branches of the district bank in any state of which the legislature at its very next session should not expressly refuse its consent to any such proceeding; and that, moreover, in case the interests of the public should seem to require it, even such express refusal might be disregarded and overridden. By this means the obnoxious institution might first be established in the Whig states, and then forced upon the Democratic states in spite of themselves. The president indignantly rejected the suggestion as "a contemptible subterfuge, behind which he would not skulk." The device, nevertheless, became incorporated in Mr. Clay's bill, and it was pretended that it was put there in order to smooth the way for the president to adopt the measure, but that in his unreasonable obstinacy he refused to avail himself of the opportunity. After his veto of 16 August these tortuous methods were renewed. Messengers went to and fro between the president and members of his cabinet on the one hand, and leading Whig members of congress on the other, conditional assurances were translated into the indicative mood, whispered messages were magnified and distorted, and presently appeared upon the scene an outline of a bill that it was assumed the president would sign. This new measure was known as the "fiscal corporation" bill. Like the fiscal bank bill, it created a bank in the District of Columbia, with branches throughout the states, and it made no proper provision for the consent of the states. The president had admitted that a "fiscal agency" of the United States government, established in Washington for the purpose of collecting, keeping, and disbursing the public revenue, was desirable if not indispensable; a regular bank of discount, engaged in commercial transactions throughout the states, and having the United States government as its principal share-holder and Federal officers exerting a controlling influence upon its directorship, was an entirely different affair--something, in his opinion, neither desirable nor permissible. In the "fiscal corporation" bill an attempt was made to hoodwink the president and the public by a pretence of forbidding discounts and loans and limiting the operations of the fiscal agency exclusively to exchanges. While this project was maturing, the Whig newspapers fulminated with threats against the president in ease he should persist in his course ; private letters warned him of plots to assassinate him, and Mr. Clay in the senate referred to his resignation in 1836, and asked why, if constitutional scruples again hindered him from obeying the will of the people, did he not now resign his lofty position and leave it for those who could be more compliant ? To this it was aptly replied by Mr. Rives that "the president was an independent branch of the government as well as congress, and was not called upon to resign because he differed in opinion with them." Some of the Whigs seem really to have hoped that such a storm could be raised as would browbeat the president into resigning, whereby the government would be temporarily left in the hands of William L. Southard, then president pro tempore of the senate. But Mr. Tyler was neither to be hoodwinked nor bullied. The "fiscal corporation" bill was passed by the senate on Saturday, 4 September, 1841; on Thursday, the 9th, the president's veto message was received; "on Saturday, the 11th, Thomas Ewing, secretary of the treasury, John Bell, secretary of war, George E. Badger, secretary of the navy, John J. Crittenden, attorney-general, and Francis Granger, postmaster-general, resigned their places. The adjournment of congress had been fixed for Monday, the 13th, and it was hoped that, suddenly confronted by a unanimous resignation of the cabinet and confused by want of time in which to appoint a new cabinet, the president would give up the game. But the resignation was not unanimous, for Daniel Webster, secretary of state, remained at his post, and on Monday morning the president nominated Walter Forward, of Pennsylvania, for secretary of the treasury; John McLean, of Ohio, for secretary of war; Abel P. Upshur, of Virginia, for secretary of the navy; Hugh S. Legare, of South Carolina. for attorney-general; and Charles A. Wickliffe, of Kentucky, for postmaster-general. These appointments were duly confirmed. Whether the defection of Mr. Webster at this moment would have been so fatal to the president as some of the Whigs were inclined to believe, may well be doubted, but there can be no doubt that his adherence to the president was of great value. By remaining in the cabinet Mr. Webster showed himself too clear-sighted to contribute to a victory of which the whole profit would be reaped by his rival, Mr. Clay, and the president was glad to retain his hold upon so strong an element in the north as that which Mr. Webster represented. 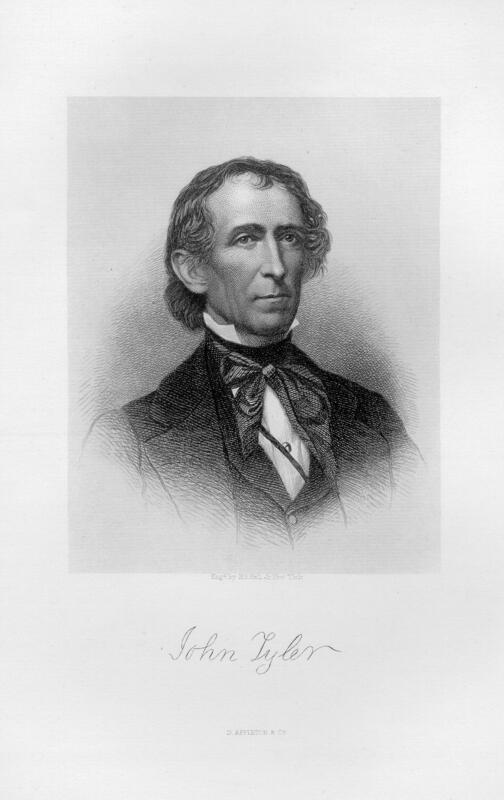 Some of the leading Whig members of congress now issued addresses to the people, in which they loudly condemned the conduct of the president and declared that "all political connection between them and John Tyler was at an end from that day forth." It was open war between the two departments of government. Although many Whig mere-bets, like Preston, Talmadge, Johnson, and Marshall, really sympathized with Mr. Tyler, only a few, commonly known as "the corporal's guard," openly recognized him as their leader. But the Democratic members came to his support as an ally against the Whigs. The state elections of 1841 showed some symptoms of a reaction in favor of the president's views, for in general the Whigs lost ground in them. As the spectre of the crisis of 1837 faded away in the distance, the people began to recover from the sudden and overmastering impulse that had swept the country in 1840, and the popular enthusiasm for the bank soon died away. Mr. Tyler had really won a victory of the first magnitude, as was conclusively shown in 1844, when the presidential platform of the Whigs was careful to make no allusion whatever to the bank. On this crucial question the doctrines of paternal government had received a crushing and permanent defeat. In the next session of congress the strife with the president was renewed : but it was now tariff, not bank, that furnished the subject of discussion. Diminished importations, due to the general prostration of business, had now diminished the revenue until it was insufficient to meet the expenses of government. The Whigs accordingly carried through congress a bill continuing the protective duties of 1833, and pro riding that the surplus revenue, which was thus sure soon to accumulate, should be distributed among the states. But the compromise act of 1833, in which Mr. Tyler had played an important part, had provided that the protective policy should come to an end in 1842. Both on this ground, and because of the provision for distributing the surplus, the president vetoed the new bill. Congress then devised and passed another bill, providing for a tariff for revenue, with incidental protection, but still contemplating a distribution of the surplus, if there should be any. The president vetoed this bill. Congress received the veto message with great indignation, and on the motion of ex-President John Q. Adams it was referred to a committee, which condemned it as an unwarrantable assumption of power, and after a caustic summary of Mr. Tyler's acts since his accession to office, concluded with a reference to impeachment. This report called forth from the president a formal protest; but the victory was already his. The Whigs were afraid to go before the country in the autumn elections with the tariff question unsettled, and the bill was accordingly passed by both houses, without the distributing clause, and was at once signed by the president. The distributing clause was then passed in a separate bill, but a "pocket veto" disposed of it. Congress adjourned on 31 August, 1842, and in the elections the Whig majority of twenty-five in the house of representatives gave place to a Democratic majority of sixty-one. On the remaining question of National Republican policy, that of internal improvements, the most noteworthy action of President Tyler was early in 1844, when two river-and-harbor bills were passed by congress, the one relating to the eastern, the other to the western states. Mr. Tyler vetoed the former, but signed the latter, on the ground that the Mississippi river, as a great common highway for the commerce of the whole country, was the legitimate concern of the national government in a sense that was not true of any other American river. An unsuccessful attempt was made to pass the other bill over the veto. The rest of Mr. Tyler's administration was taken up with the Ashburton treaty with Great Britain, the Oregon question, and the annexation of Texas. Texas had won its independence from Mexico in 1836, and its governor, as well as the majority of its inhabitants, were citizens of the United States. From a broad national standpoint it was in every way desirable that Texas, as well as Oregon, should belong to our Federal Union. In the eastern states there was certainly a failure to appreciate the value of Oregon, which was nevertheless claimed as indisputably our property. On the other hand, it was felt, by a certain element in South Carolina, that if the northern states were to have ample room for expansion beyond the Rocky mountains, the southern states must have Texas added to their number as a counterpoise, or else the existence of slavery would be imperiled, and these fears were strengthened by the growth of anti-slavery sentiment at the north. The Whigs, who by reason of their tariff policy found their chief strength at the north, were disposed to avail themselves of this anti-slavery sentiment, and accordingly declared themselves opposed to the annexation of Texas. In the mean time the political pressure brought to bear upon Mr. Webster in Massachusetts induced resignation of his portfolio, and he was succeeded in the state department by Hugh S. Legare, 9 May, 1843. In a few weeks Legare was succeeded by Mr. Upshur, after whose death, on 28 February, 1844, the place was filled by John C. Calhoun. After a negotiation extending over two years, a treaty was concluded, 12 April, 1844, with the government of Texas, providing for annexation. The treaty was rejected by the senate, by a vote of 35 to 16, all the Whigs and seven Democrats voting in the negative. Thus by the summer of 1844 the alliance between the Whig party and Mr. Tyler's wing of the Democrats had passed away. At the same time the division among the Democrats, which had become marked during Jackson's administration, still continued; and while the opposition to Mr. Tyler was strong enough to prevent his nomination in the Democratic national convention, which met at Baltimore on 27 May, 1844, on the other hand he was able to prevent the nomination of Mr. Van Buren, who had declared himself opposed to the immediate annexation of Texas. The result was the nomination of James K. Polk, as a kind of compromise candidate, in so far as he belonged to the "loco-foco " wing of the party, but was at the same time in favor of annexation. On the same day, 27 May, another convention at Baltimore nominated Mr. Tyler for a second term. He accepted the nomination in order to coerce the Democrats into submitting to him and his friends a formal invitation to re-enter the ranks ; and accordingly a meeting of Democrats at the Carleton house, New York, on 6 August, adopted a series of resolutions commending the principal acts of his administration, and entreating that in the general interests of the opposition he should withdraw. In response to this appeal, Mr. Tyler accordingly withdrew his name. The northern opposition to the annexation of Texas seemed to have weakened the strength of the Whigs in the south, and their candidate, Henry Clay, declared himself willing to see Texas admitted at some future time. But this device cut both ways ; for while it was popular in the south, and is supposed to have acquired for Clay many proslavery votes, carrying for him Tennessee, North Carolina, Delaware, and Maryland by bare majorities, it certainly led many anti-slavery Whigs to throw away their votes upon the "Liberty" candidate, James G. Birney, and thus surrender New York to the Democrats. The victory of the Democrats in November was reflected in the course pursued in the ensuing congress. One of the party watchwords, in reference to the Oregon question, had been "fifty-four forty, or fight," and the house of representatives now proceeded to pass a bill organizing a territorial government for Oregon up to that parallel of latitude. The senate, however, laid the bill upon the table, because it prohibited slavery in the territory. A joint resolution for the annexation of Texas was passed by both houses. Proposals for prohibiting slavery there were defeated, and the affair was arranged by extending the Missouri compromise-line westward through the Texan territory to be acquired by the annexation. North of that line slavery was to be prohibited; south of it the question was to be determined by the people living on the spot. The resolutions were signed by President Tyler, and instructions in accordance therewith were dispatched by him to Texas on the last day of his term of office, 3 March, 1845. The friends of annexation defended the constitutionality of this proceeding, and the opponents denounced it. After leaving the White House, Mr. Tyler took up his residence on an estate that he had purchased three miles from Greenway, on the bank of James river. To this estate he gave the name of "Sherwood Forest," and there he lived the rest of his life. In a letter published in the Richmond " Enquirer" on 17 January, 1861, he recommended a convention of border states--including New Jersey, Pennsylvania, Ohio, Indiana, Illinois, and Iowa, as well as Delaware, Maryland, Virginia, Kentucky, Tennessee, and Missouri--for the purpose of devising some method of adjusting the difficulties brought on by the secession of South Carolina. The scheme adopted by this convention was to be submitted to the other states, and, if adopted, was to be incorporated into the Federal constitution. 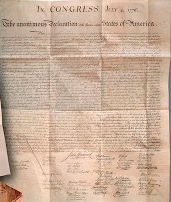 In acting upon Mr. Tyler's suggestion, the Virginia legislature enlarged it into a proposal of a peace convention to be composed of delegates from all the states. At the same time Mr. Tyler was appointed a commissioner to President Buchanan, while Judge John Robertson was appointed commissioner to the state of South Carolina, the object being to persuade both parties to abstain from any acts of hostility until the proposed peace convention should have had an opportunity to meet and discuss the situation. In discharge of this mission Mr. Tyler arrived on 23 January in Washington. President Buchanan declined to give any assurances, but in his message to congress, on 28 January, he deprecated a hasty resort to hostile measures. The peace convention, consisting of delegates from thirteen northern and seven border states, met at Washington on 4 February and chose Mr. Tyler as its president. Several resolutions were adopted and reported to congress, 27 February ; but on 2 March they were rejected in the senate by a vote of 28 to 7, and two days later the house adjourned without having taken a vote upon them. On 28 February, anticipating the fate of the resolutions in congress, Mr. Tyler made a speech on the steps of the Exchange hotel in Richmond, and declared his belief that no arrangement could be made, and that nothing was left for Virginia but to act promptly in the exercise of her powers as a sovereign state. The next day he took his seat in the State convention, where he advocated the immediate passing of an ordinance of secession. His attitude seems to have been substantially the same that it had been twenty-eight years before, when he disapproved the heresy of nullification, but condemned with still greater emphasis the measures taken by President Jackson to suppress that heresy. This feeling that secession was unadvisable, but coercion wholly indefensible, was shared by Mr. Tyler with many people in the border states. On the removal of the government of the southern Confederacy from Montgomery to Richmond, in May, 1861, he was unanimously elected a member of the provisional congress of the Confederate states. In the following autumn he was elected to the permanent congress, but he died before taking his seat. His wife, Letitia Christian Tyler, born at Cedar Grove, New Kent County, Virginia, 12 November, 1790; died in Washington, D. C., 9 September, 1842, was the daughter of Robert Christian, a planter in New Kent county, Virginia. She married Mr. Tyler on 29 March, 1813, and removed with him to his home in Charles City county. When he became president she accompanied him to Washington; but her health was delicate, and she died shortly afterward. Mrs. Tyler was unable to assume any social cares, and the duties of mistress of the White House devolved upon her daughter-in-law, Mrs. Robert Tyler. She possessed great beauty of person and of character, and, before the failure of her health, was especially fitted for a social life. 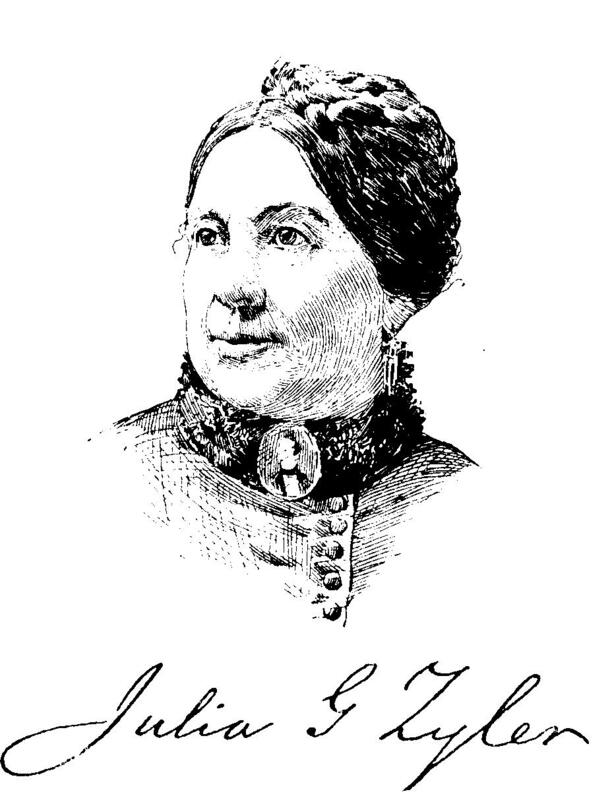 -President Tyler's second wife, Julia Gardiner Tyler, born on Gardiner's island, near Easthampton, New York, in 1820, was the eldest daughter of David Gardiner, a descendant of the Gardiners of Gardiner's island. She was educated at the Chegary institute, New York city, spent several months in Europe, and in the winter of 1844 accompanied her father to Washington, D.C. A few weeks afterward he was killed by the explosion of a gun on the wear-steamer "Princeton," which occurred during a pleasure excursion in which he and his daughter were of the presidential party. His body was taken to the White House, and Miss Gardiner, being thrown in the society of the president under these peculiar circumstances, became the object of his marked attention, which resulted in their marriage in New York city, 26 June, 1844. For the succeeding eight months she presided over the White House with dignity and grace, her residence there terminating with a birth-night ball on 22 February, 1845. Mrs. Tyler retired with her husband to " Sherwood Forest" in Virginia at the conclusion of his term, and after the civil war resided for several years at her mother's residence on Castleton Hill, Staten island, and subsequently in Richmond, Virginia She is a convert to Roman Catholicism, and devoted to the charities of that church. --Her son, Lyon Gardiner Tyler, born in Charles City county, Virginia, in August, 1853, was graduated at the University of Virginia in 1875, and then studied law. During his college course he was elected orator of the Jefferson society, and obtained a scholarship as best editor of the "Virginia University Magazine." 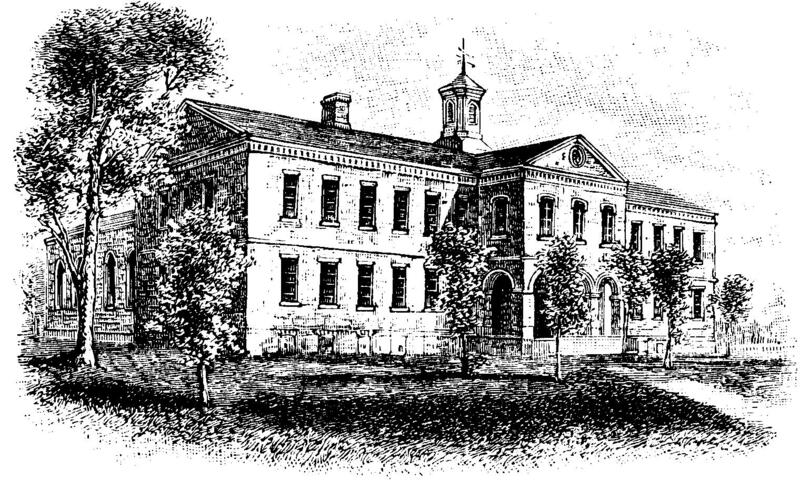 In January, 1877, he was elected professor of belles-lettres in William and Mary college, which place he held until November, 1878, when he became head of a high-school in Memphis, Tennessee He settled in Richmond, Virginia, in 1882, and entered on the practice of law, also taking an active interest in politics. He was a candidate for the house of delegates in 1885, and again in 1887, when he was elected. In that body he advocated the bills to establish a labor bureau, to regulate child labor, and to aid William and Mary college. In 1888 he was elected president of William and Mary. He has published "The Letters and Times of the Tylers " (2 vols., Richmond, 1884-'5). Start your search on John Tyler.